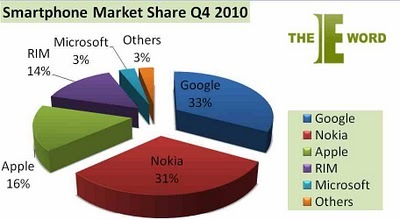 The year 2010 ended with Google claiming the top spot in smartphone market share. The search engine behemoth has seen its Android operating system help power its smartphones to the market leader position. During Q4 2010, 33.3 million smartphones shipped ran on Android, representing 32.9 per cent of the overall 101.2 million units sold. This marks an increase of 24.2 per cent on the 4.7 per cent share they enjoyed over the same period in 2009, and sees it leapfrog Apple and Nokia into first place. Google's gain in Q4 can be partly attributed to the release of the Nexus S on December 7th, a model which incorporated Gingerbread 2.3 – then the most up-to-date version of Android. The Nexus S wasn't the year's only big release – and it certainly wasn't the most publicised. In June, Apple's iPhone 4 arrived in shops, greeted by eager customers queuing for hours to get their hands on the device. Over Q4 2010, Apple's smartphone share, driven primarily by iPhone sales, took 16 per cent of the market with 16.2 million Apple-branded units sold. Nokia recorded the biggest dip in sales. It has watched its share of the market dwindle since the release of the iPhone and Android-driven devices, and Q4 2010 was no exception. Over this period, 13.8 per cent fewer people opted for Nokia smartphones, with the firm selling eight million fewer handsets. Nokia's downturn in fortunes has perhaps been summed up best by the memo issued to staff by CEO Stephen Elop. It read: "[We] are standing on a 'burning platform', and we must decide how we are going to change our behaviour. We have more than one explosion – we have multiple points of scorching heat that are fuelling a blazing fire around us." Nokia may see something of a revival in the next few months, following its announcement that it will be primarily incorporating Microsoft's Windows Mobile 7 as its smartphone platform. The two firms will be hoping to build on the combined 33.4 per cent market share they hold – 1.2 per cent bigger than Google.